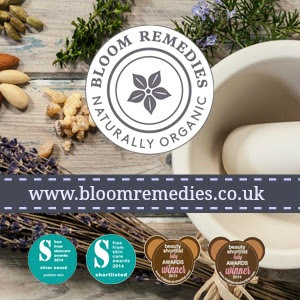 Aromatherapy has become a huge part of life, whether it’s to calm and soothe when I am restless or purifying oils when I am not feeling well, it has become an essential part of my self care. There are so many different ways to use essential oils around the home and the benefits are endless, it really is a tool that can be beneficial to everyone. Essential oils are natural essences found in plants, flowers and trees. 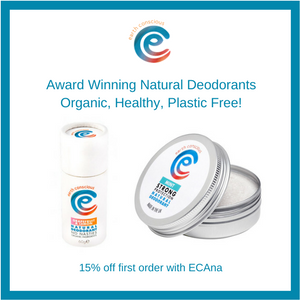 These natural essences are extracted using different methods to obtain what we know as the essential oils. Essential oils are products of natural origin, but it is worth noting that they are potent ingredients and should be treated with respect. I always store mine securely out of reach of children and away from other products such as eye drops, so that mix ups are unlikely to occur. 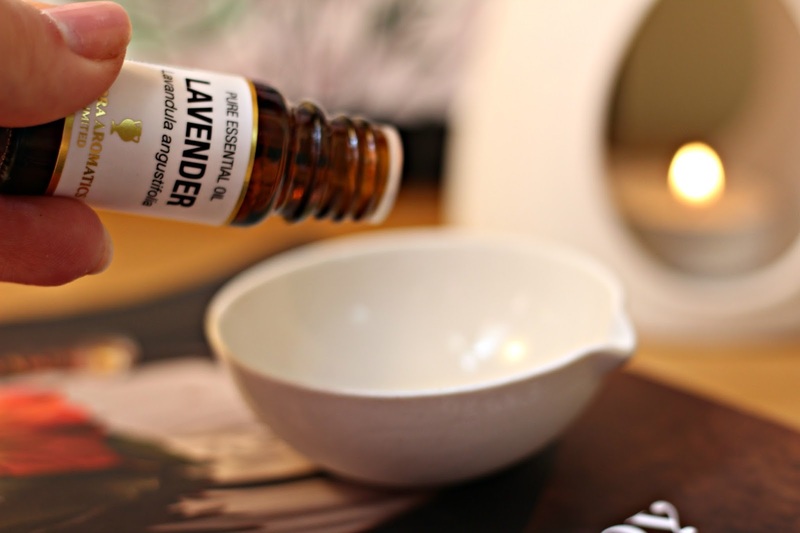 By following some basic safety tips you can enjoy all the benefits of essential oils in your home, these really are mainly common sense, but worth thinking about. Having written about natural beauty for the last five years, I realised that something a lot of my favourite brands had in common was that they used high quality essential oils both for their skincare properties and gorgeous scent. Since I started to incorporate essential oils in to my everyday life, I have found the benefits to be enormous, especially when it comes to helping with my mood and dealing with stress. There is solid science to back up the effects of aromatherapy too, for example most recently there was study showing that Rosemary essential oil can have a positive impact on short term memory. 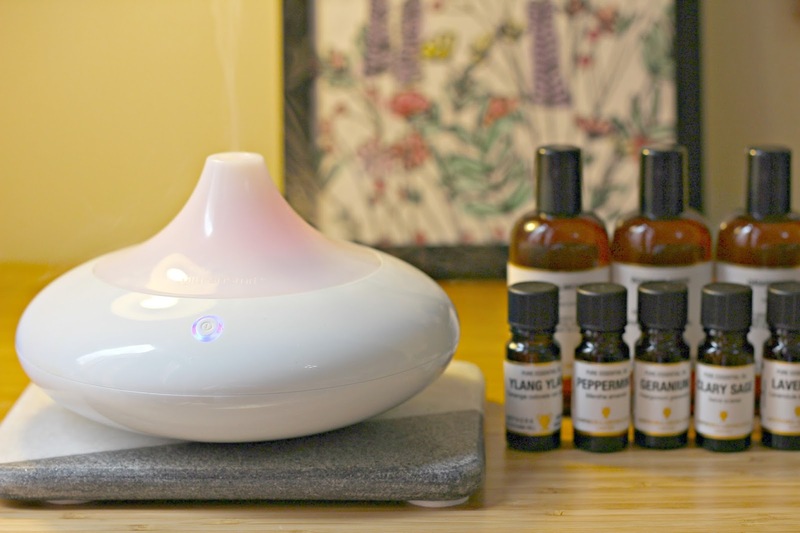 Using a diffuser to scent your home – I absolutely love my diffuser, it’s easy to use and the mist fills a room with your chosen scent with ease. I use my diffuser most days, I find putting it on once in the morning and once in the evening more than enough and you can create your own blend or use a pre-made one. Using the diffuser means I don’t need any other home fragrance, it’s a great alternative to candles and it can really help clear the air as well as acting a humidifier too. You can also use a more traditional burner that you use a candle with, I have both and although in terms of getting the scent in to the room the electric diffuser is more efficient, there is something lovely about using a more traditional burner too. 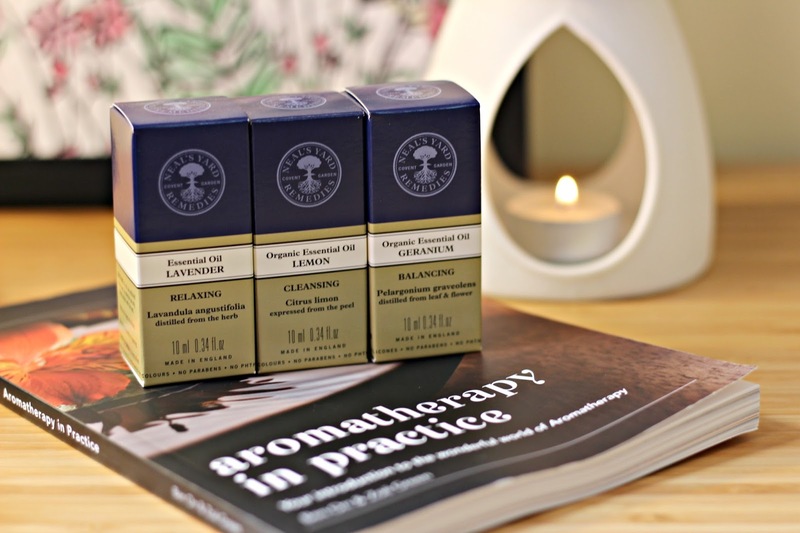 When it comes to essential oils I like to choose good quality and I use a variety of brands including Neal’s Yard, Tisserand and Amphora Aromatics. 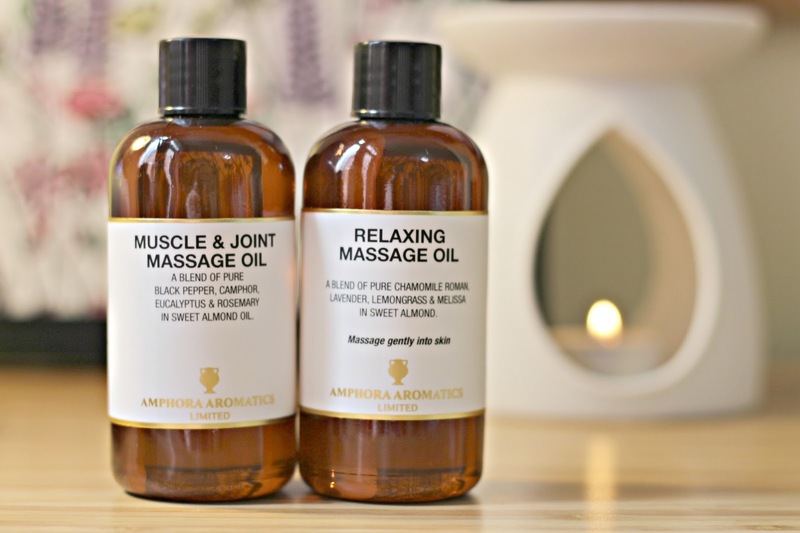 Amphora Aromatics are fantastic for budget friendly essential oils and they also have certified organic options, you can find their full range here. Custom blended oils – Another way to enjoy essential oils is blending your own custom body, face or bath oils. 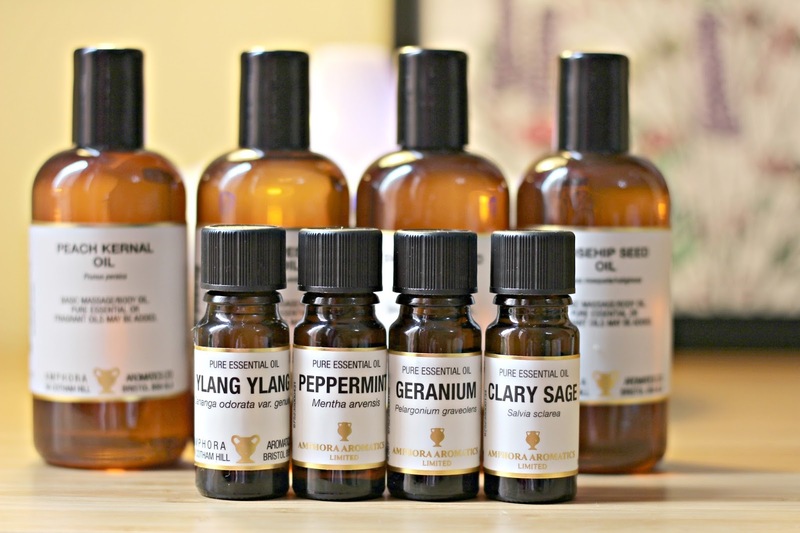 When using essential oils topically you need to always use them diluted with a good quality carrier oil, I love this handy guide from Amphora Aromatics that tells you about the properties of each carrier oil. 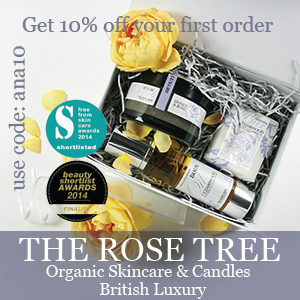 I love to blend several oils, Rosehip is one of my favourites as it helps with scars and marks. It is important to use the right amount of carrier oil to essential oils, if you are new to essential oils or if you want to learn more, I recommend you use a book with information and recipes to follow to start you off. I use Aromatherapy in Practice and I love the simple recipes, especially the hair oils which I use weekly. Pre-made blends – If you don’t feel you want to blend your own using a premade oil can be a great introduction. The ones from Amphora Aromatics are phenomenal value and last ages, so if budget is tight I can’t recommend them highly enough. I also have a range of pulse point remedies and pillow sprays to use when I need them. Hopefully this introduction will show you that aromatherapy is extremely beneficial and easy to incorporate in to everyday life. I will be bringing you more posts with some of my favourite blends for energising, calming and relaxing soon, so look out for those. Do you use aromatherapy? What’s your favourite method?